The package comprises: 2 Separate aircraft folders ( _AVRO 646 Sea Tutor early and _AVRO 646 Sea Tutor late), 3 models, 6 texture liveries, custom panels, 2 custom soundsets: Armstrong Siddeley Mongoose and Armstrong Siddeley Lynx engines. Milton Shupe for many hours of painstaking mentoring. James Banks for giving life to the flight dynamics. Tom Zimmerman for many long hours of sounds testing. SOH members beta test team. Uploaded to Warbirds section - available shortly. Whoow... I love floaters !!! 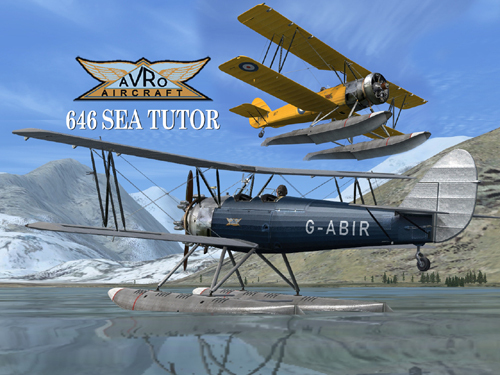 The package comprises: 2 Separate aircraft folders ( _AVRO 646 Sea Tutor early and _AVRO 646 Sea Tutor late), 3 models, 6 texture liveries, custom panels, 2 custom sound sets: Armstrong Siddeley Mongoose and Armstrong Siddeley Lynx engines. Copyrights: FS2004, FSX flight sim aircraft AVRO series designed by Nigel Richards. Flight Model Design: James Banks, Milton Shupe, Pete Collis, Keith Paine. Gauges: Roman Stoviak, Nigel Richards, Keith Paine, Microsoft. Special thanks to: Milton Shupe for many hours of painstaking mentoring. ........... is there a way of removing the pilot from the exterior view when aircraft is parked and engine/instruments are turned 'off' ? I came across some aircraft before where pilots disappeared when certain conditions were met (parking brake set, battery off, etc. based on type of aircraft). You're most welcome, Marijn - Have FUN!!! The detail is truly amazing Nigel! Thank you so much - the Tutor on floats is such a nice addition to the series. Another very, very fine masterpice from you and your team. Many Thanks, Ted - awesome that we share the same love for detail, my friend. Very much appreciated, Dirk - and a great reward to see folks enjoying these classic aircraft types once again. Many Thanks, dvj - WOW!!! That's a mighty stunning screenshot of the HMS Daedalus livery, Sir - Thanks for sharing. Applause for everyone on this! A real beauty, just took G-AAKT for a jaunt from Lake Windermere to Ullswater. A beaut to fly! dvj, what a beautiful screen shot, worthy of a frame and placement in a prominent place. 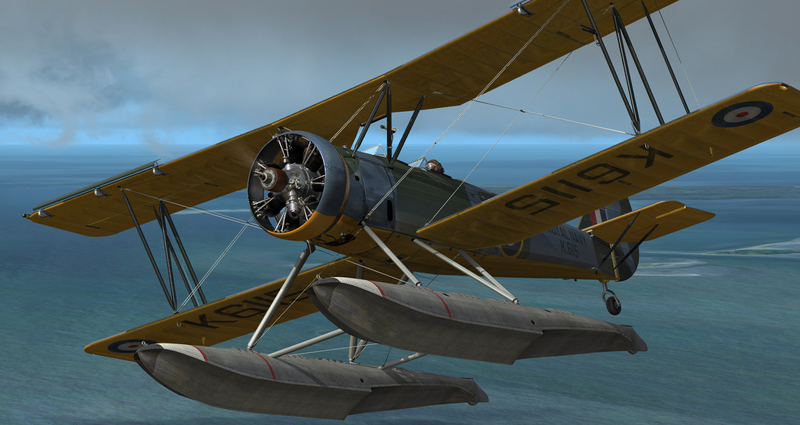 The latest iteration of the Avro series, the seaplanes, is spectacular. Not only are the planes world class, but the settings they operate in feel right. The water effects had me wiping the spray off my goggles! johnwillimas2: 'a jaunt from Lake Windermere to Ullswater' Now that's music to my ears, Sir! Steve; I'm highly touched by those remarks, Sir - especially from someone so very talanted and whom I proudly regard as FRIEND! Mighty kind of you to say so, downwind - and very much appreciated, Sir! Keep doing what you obviously love doing most, my friend! Both humbled, and honoured to be part of that fun. These AVRO's are all gorgeous and quickly becoming my faves for ground scenery exploration.